There was a fairly thick cloud cover flying into Lyon. We broke through the clouds at about 10,000 feet. This view is looking out the starboard (right) side of the plane towards the south. 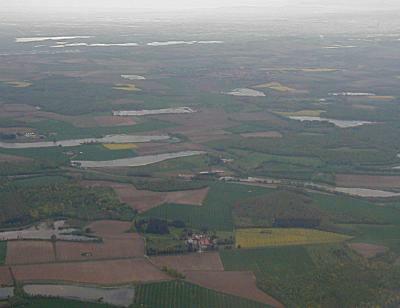 It is a bit hazy, but you can see cultivated fields and some small lakes. The lakes appear to be white with ice, but that's just the reflected cloud cover. 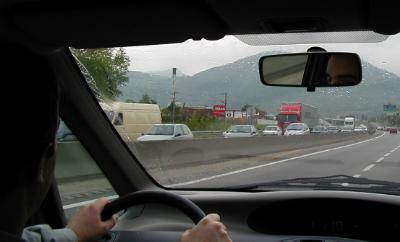 To get to Grenoble from Lyon I took the Satobus from the Lyon airport. 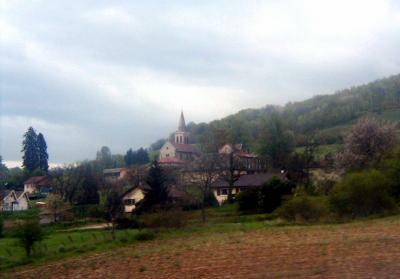 The bus takes you through some pretty countryside directly to downtown Grenoble. 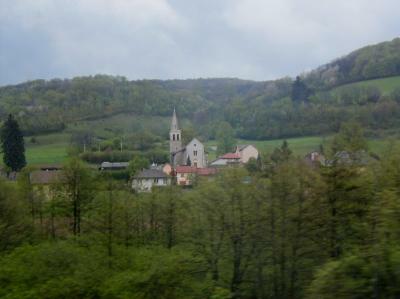 This is one of the small villages we passed on the way. This is another small village. The bus ride takes about 50 minutes or so. You can buy a one-way ticket for 130 FF (about 20 dollars), or you can buy a round-trip ticket for 195 FF (about 29 dollars). With the round-trip ticket you get a small piece of paper that, if you don't misplace it, is good for the return trip. 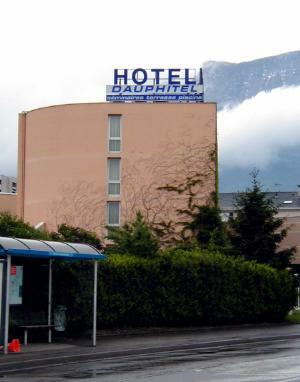 The hotel I was booked at is Hotel Dauphitel. 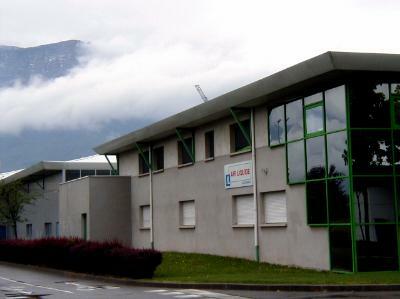 It's pretty convenient to get to Air Liquide, which is just down the road. That's about all it's close to, however, other than the hospital across the street. The hotel is about 5 km from town - a 110 FF taxi ride (a little under 20 dollars). The bus stop in front lets you catch a bus back to Grenoble - on days the bus is running, that is. The hotel is very nice, and has a nice looking restaurant on the first floor. That's good, because there doesn't seem to be any other restaurants close by. Too bad it, like almost everything else, was closed on the day I arrived. Who knew - May 1st is a BIG DEAL here, and almost nothing is open. By the way, the restaurant at the hotel was actually very good. The ostrich was excellent, and the desserts - well, there is a reason I look fat in the photos..
After resting for a bit I decided to go for a quick walk. 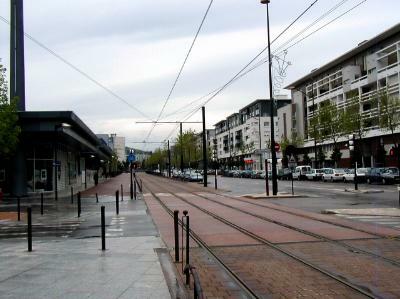 This is the main tram (or train) tracks in the local town of Echirolles, about a 10 minute walk away. They, like the busses, aren't running on May 1st. The reason I came here - meetings at Air Liquide. You can see some of the surrounding mountains in the background. You can also see some of the surrounding rain clouds that are predicted to be here this week. 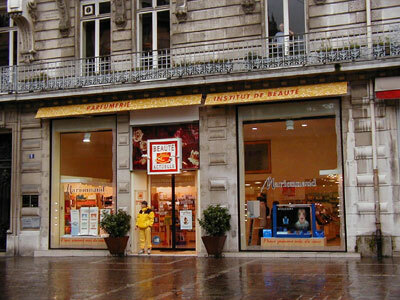 Air Liquide is about a 5 minute walk from the hotel (in the other direction from the tram). 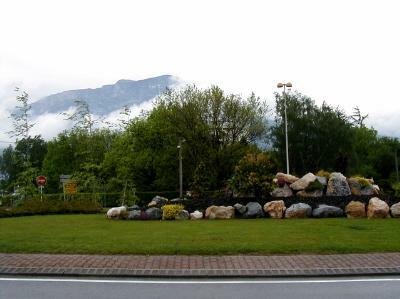 This is a small park in the town. I waited around a bit for some people to walk in for the photo, but the clouds were keeping most of them away. This is looking back from the traffic circle near Air Liquide. The roads all have bike lanes and pedestrian walk areas, and the area seems to be very clean. This is back in the town. These kids are some of the few people out walking about in the rain, besides silly American tourists. If you look closely you can see the fountain in the background. These are some of the houses along the main street. 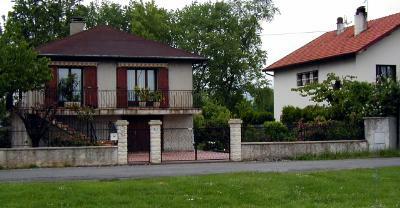 Most of the roofs are made of tile, and almost all of the houses have surrounding fences or hedges. Flowers are in full bloom here - I would say that the growing season starts about 3 to 4 weeks earlier than in upstate New York. Wednesday, on the way back from Air Liquide construction facility at about 6PM. Our side of the highway is doing about 100 kmph (60 mph). The other side is doing about 0 - just like any highway at home. Guess they have the same shortage of lions (or too many guardrails) here. After a very good dinner I went for a walk around the area again. 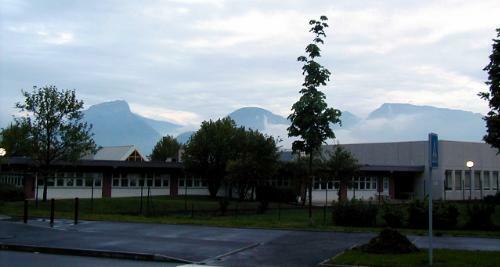 The clouds had lifted a bit, and you can see some of the mountains looking back towards Grenoble. These aren't the higher peaks - they would be farther around to the left in this photo. What you can't see from the photo is how high the peaks really are, and how close. In case this does you any good, direction wise. 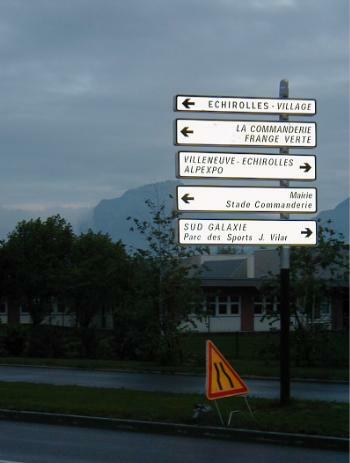 The town where the hotel is located is called Echirolles. The flash makes the sign stand out rather well. 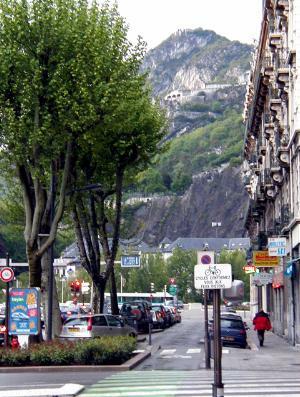 Grenoble is situated on a plain surrounded be very steep mountains. The peaks aren't more than 10 or 15 km away, and they rise pretty much straight up. The high peaks (that aren't really visible in these photos) are still covered with snow. The snow is usually gone by the beginning of June. Thursday evening we went to dinner in downtown Grenoble. This is a photo looking down the main street towards the mountain. 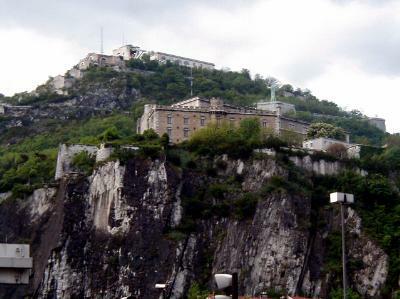 The buildings you see about half way up are part of the bastille on the mountain. 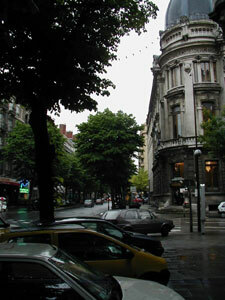 This is also downtown, looking off to the left from the same location as the photo above. At this time of night (about 8PM), about the only things open are the restaurants. Many of the restaurants stay open until about midnight, which turned out to be a good thing. 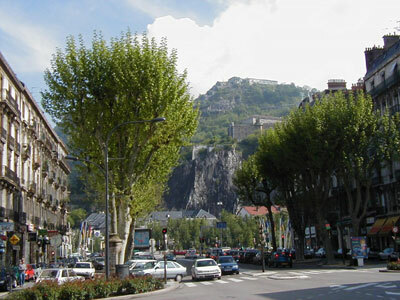 This is another photo of the bastille and fortifications on the mountain. Just below the mountain is a lovely river. The fortifications were built to protect the region from Italy, which lies to the South-East from here. The pylons (that you can barely see here) carry a cable car system with 4 "eggs" that you can ride up to the top. Thursday night we met Bill Schaphorst from Schneider Electric - America for a nice dinner. 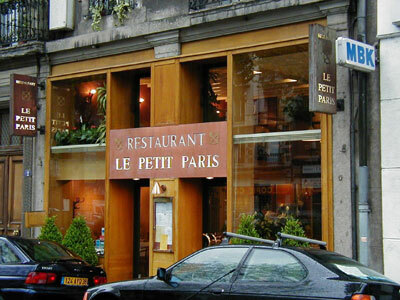 Emmanuel suggested this restaurant, Le Petit Paris. An excellent suggestion! Did I mention that the dinner was very good? This was taken about 11:30PM, after our 3 hour dinner. Thanks to Mr. Schaphorst for his hospitality, and for the good French wine..
Friday we wrapped up in the late afternoon (well, late for US time - about 3:30 to 4PM. Early for there, where we usually stayed to about 6PM. 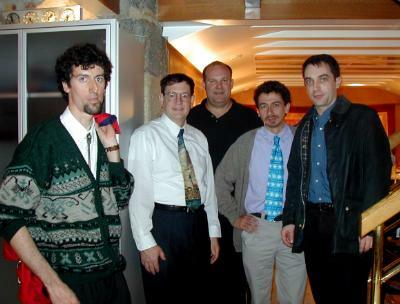 This is a photo of the group of us at Air Liquide. Friday was fairly rainy - one of my first purchases was an umbrella. 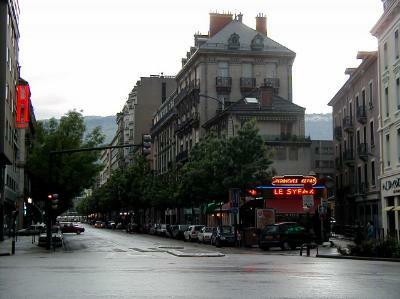 This is a shot of one of the older buildings in downtown Grenoble. You can't see it here, but the writing on the building basically says that it is the Commerce Building. This isn't in the main shopping area, but about a block to the north. This is one of the many fountains along the walkway. If you look close you can see the tram behind and to the left of the fountain. 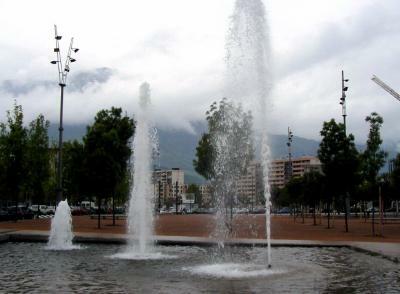 There is a reason everything looks wet, and it's got nothing to do with the fountain. 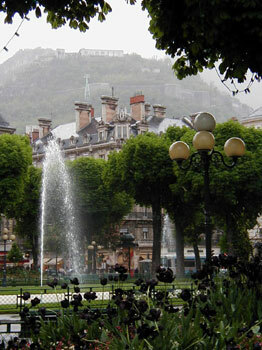 This is one of the pretty parks in Grenoble. When I track down my map I'll fill in the proper name. 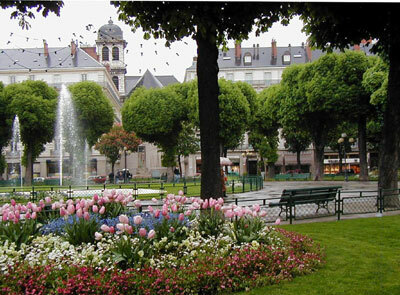 You can see some of the buildings behind the flowers and fountains. One of the restaurants has an outdoor seating area. The waiters cross the pedestrian walkway with the food, etc. Nobody seemed too keen on using it on Friday, although there were some people in it on Saturday night. This is the same park, from a slightly different angle. As you can see I was there at a great time for the flowers. The dark purple flowers are tulips that were almost black. The mounain and Bastille are to the back of this shot. If you look close you can just see one of the gondola towers on the mountainside. It's all well and fine to walk around and take photo's, but if you don't bring something back for the wife you might as well plan on staying there. This looked like a good bet. The sales girl was very friendly, and Martha liked her gift. Prices were about the same as buying it in the US (versus food, which was for the most part cheaper, or clothes which were MUCH more expensive). From the Bastille you can get a beautiful view of the surronding country - or so the books say. 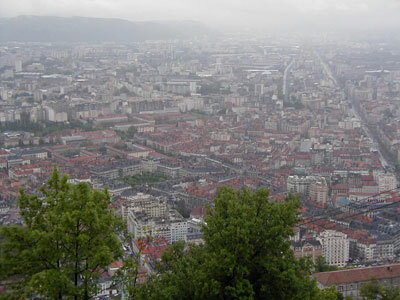 This is a view looking down on Grenoble. 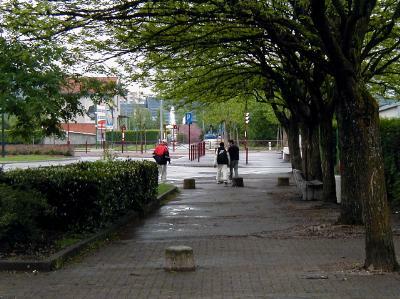 The university is off to the left, and Echirolles is in the center out a bit. It was rainy and windy at the top, at least on the day I was there, so the visibilty is only a few miles. The Gondola costs 45F for a round trip. A little over 6 dollars, at least while I was there. This is a view from inside one of the eggs coming back down. You can see some of the fortifications and the river below. At least I could. 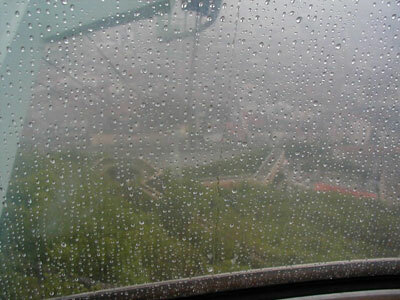 You can mostly see rain on the gondola, since that's what the autofocus on the camera picked up. It didn't rain all the time I was there - this is a shot taken on Saturday morning. 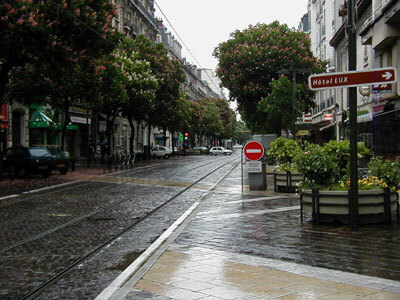 The blue sky didn't last...by the time I got to Lyon it had clouded back over. 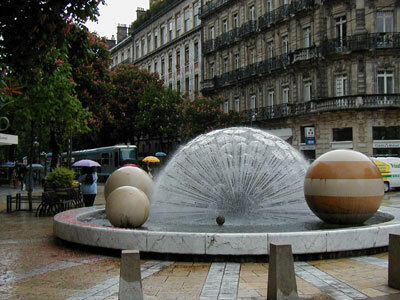 My Lyon photo's will be up soon - check back. This was taken early in the morning on Sunday - before the sun came up, which explains the horrid quality of the photo. This is the bus that takes you from Grenoble to the airport in Lyon. 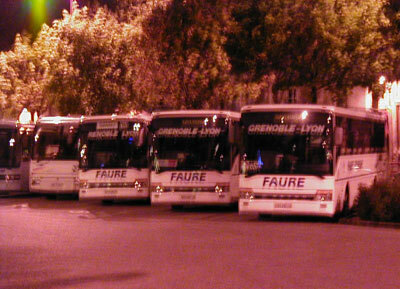 Our bus was about 30 minutes late in leaving Grenoble - seems that the driver forgot (or couldn't find) a key for the bus!